​Ithaca started celebrating Halloween early this year with "Halloween in Downtown Ithaca." On Friday, Oct 26, The Greater Ithaca Activities Center (GIAC) hosted this family-friendly event that included costumes, food, music and (most importantly) trick-or-treating from 4 p.m. to 6 p.m. 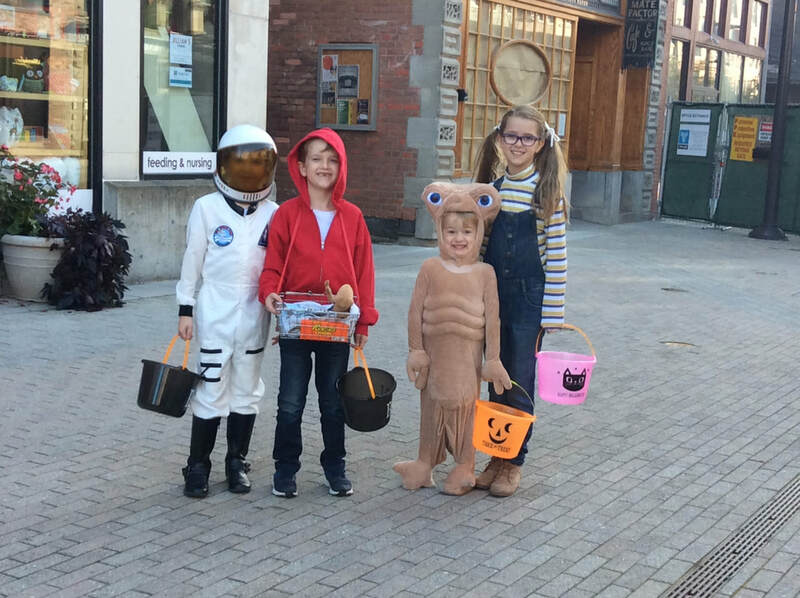 Businesses all around downtown Ithaca opened their doors for trick-or-treaters, but the main action was in the Commons. That's where people were getting geared up for Wizarding Weekend, a three-day long festival inspired by Harry Potter. Although the festivities related to the Wizarding Weekend had not started yet, there were many people in the commons dressed up in Harry Potter themed costumes. Rebecca Sharkey and Lauren Obusek, who were in the Commons looking for wizard-related fun, said they and were surprised by all of the trick-or-treaters. Sharkey was walking the Commons in a home-made costume for Wizarding Weekend, and found herself as part of the Halloween event. She said that she loves dressing up, and this weekend was a perfect opportunity to break out a helmet she originally made for an art class. "This is my helmet for positive energy," she said about her headgear. Based on the number of people in costumes not related to Harry Potter, a lot of people knew exactly what they were getting in to when they stepped out in the Commons. Some parents wore regular clothes while taking their children trick-or-treating, but others joined in on the fun. 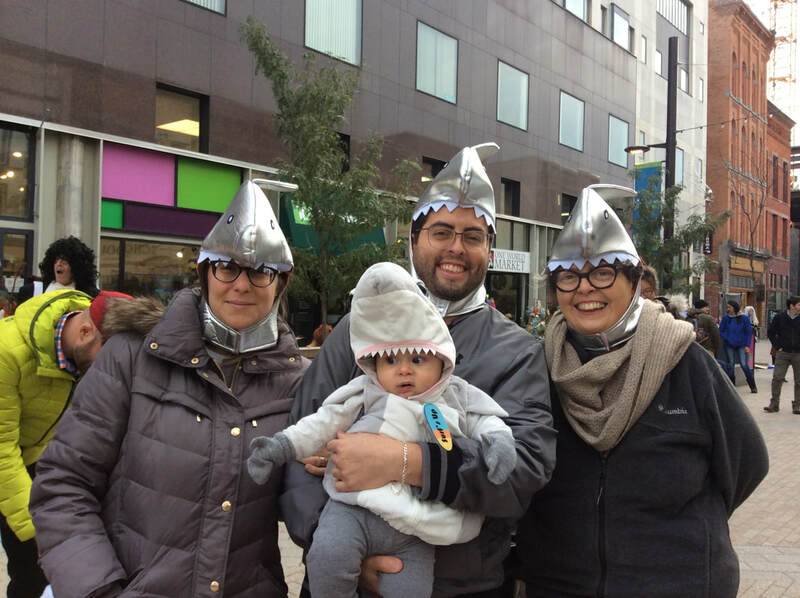 One family all wore shark costumes and another dressed up as characters from The Nightmare Before Christmas. One thing that all parents had in common was having to chase after their trick-or-treating kids. Eager children ran from store to store to stock up on candy. Kids actually had to go inside to get their treats, but other shops made things a little bit easier by greeting them outside. Aleisha Akers actually stood outside of her apartment to hand out cookies. Akers, an employee for GIAC, said that one of her favorite parts of Halloween is seeing everyone having fun in their costumes. "Seeing the costumes that are real throwbacks or something you weren't expecting, I think that's awesome," said Akers. The Robbins family used their costumes to pay homage to the 1982 classic E.T. While the movie is iconic and instantly recognizable for most people, Celia Robbins said that her kids were worried that people wouldn't understand what they were wearing. ​"They weren't sure about dressing up as E.T. because they didn't think anyone their age would know it," Robbins said. ​The other young children were probably too worried about getting candy to think much about their peers' costumes, though. The Robbins kids were also very determined on their quest for candy. As soon as their picture was snapped, they ran into the closest store and didn't stop running for the rest of the evening.